This week we shift from current shows to long-lost shows, focusing on a pair of quirky death-centric stories created by Bryan Fuller. “Dead Like Me” saw two solid seasons on Showtime and a less-than-solid straight-to-DVD movie a few years later. “Pushing Daisies” couldn’t catch a break, stumbling through only two partial seasons on ABC. But both are worth checking out today, on DVD or via Netflix streaming. “Dead Like Me” follows the post-death life of Georgia “George” Lass (Ellen Muth), who becomes a Grim Reaper and receives regular assignments to collect the souls of the soon-to-be dead. 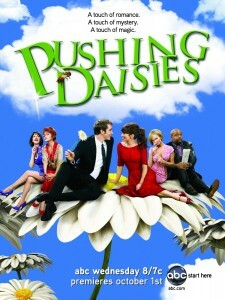 “Pushing Daisies” is described as a “forensic fairy-tale,” in which a pie-maker with a magical touch (Ned, played by Lee Pace) and a murdered childhood love (Charlotte, played by Anna Friel) join forces with a private investigator to solve crimes while uncovering secrets in their own lives. “Pushing Daisies” is described as a spinoff of “Dead Like Me.” We love to imagine on our own how the two worlds might intersect. Are you a fan of either or both of these shows? Any other Fuller projects (Wonderfalls, Star Trek: DS9) we should check out? This entry was posted by Ryan on June 6, 2011 at 3:27 pm, and is filed under Podcasts, TV. Follow any responses to this post through RSS 2.0. You can leave a response or trackback from your own site.